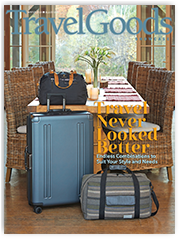 Nestled in the Sonoran Desert of Southern Arizona just 45 minutes south of Tucson is the artist’s colony of Tubac, recently named by Travel + Leisure as one of America’s best up-and-coming small towns. The enchanting village with its mountain views, stunning sunsets and cooler desert temperatures has become a well-known arts destination with a variety of shops, master artisans, and renowned galleries. tubacaz.com. Today’s business isn’t contained – it’s not confined to the office, it’s not conducted strictly 9-5. 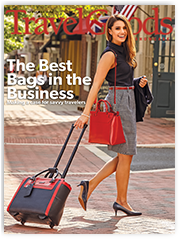 Modern business happens anyplace, and it’s very much an on-the-go affair. 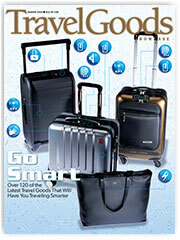 And travel goods make it possible. Model: Nikki Rose, Reinhard, Inc.
For every product sold, United By Blue cleans one pound of trash from the world’s waterways. Since its 2010 founding, it’s expanded to four stores, three in Pennsylvania and one in Manhattan, and has surpassed the million-pound clean-up mark. The flagship store in Old City, Philadelphia is a space that mixes their complete line of apparel and accessories with a full-fledged coffeehouse serving up some of the city’s finest organic coffee and food. Their purpose: to create a welcoming, collaborative space grounded in sustainability for the Philadelphia community. 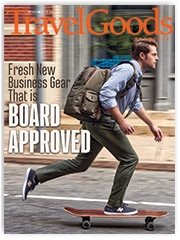 For more on UBB, see our Corporate Social Responsibility story beginning on page 52. Special thanks to Mike Cangi and the team at United By Blue’s flagship store in Philadelphia, PA for providing the backdrop for this issue’s cover. 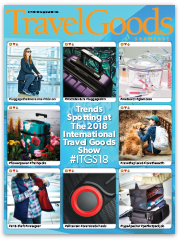 What’s trending, what’s hip, and what people are buzzing about from The 2018 International Travel Goods Show. These are the new directions in travel gear. 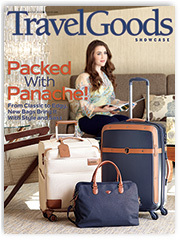 From left to right (top row) Modobag, Group III International, Americas Travel Merchandise; (middle row) Triforce Luggage, United By Blue; (bottom row) Pacsafe, G-RO, Grand Fusion Housewares. Photographed at the Cira Center in Philadelphia, PA, the Terrace Lofts Apartments (terraceloftsapartments.com) in Manayunk, PA, with special thanks to Andrew Langsam, and Smithville Park in Eastampton, NJ. 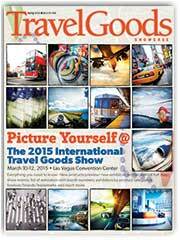 Photos submitted by our Show attendees provide this cover’s backdrop, reminding us it’s a big, beautiful world. This is why we travel. This is the adventure, the excitement that drives and inspires all of us. 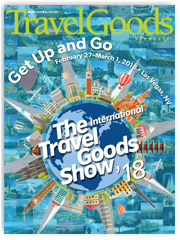 Which you’ll find in abundance at The 2018 International Travel Goods Show. Ricardo Beverly Hills’ San Marcos 16” Under the Seat Rolling Tote fits perfectly under the seat in front of you while offering organized storage for technology items, MSRP: $280. Antler USA’s hybrid cabin case gives travelers the flexibility to adapt the case to their journey. The removable cover has a zip pocket for an umbrella, a fleece-lined lower pocket for a tablet and a top easy-access pocket for essentials, MSRP: $260. Pacsafe’s Versatile Vibe is a patented 40L anti-theft carry-on backpack designed for 24/7 city living, MSRP: $139.95. 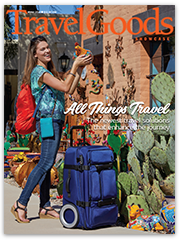 Get going with the newest travel gear from The 2107 International Travel Goods Show. 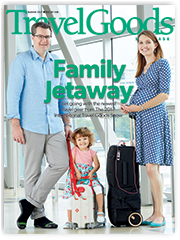 Real-life family Kevin, Caileen and Rita Kondrath of Medford, NJ, embark on a real-life vacation with this year’s trio of Product Innovation Award winners. Kevin is shod in Smoots‘ checkpoint-friendly Comfort Conscious Footwear, with recycled rubber soles and bamboo/cotton blend uppers. Caileen rides aboard the JetKids® BedBox®, a ride-on/carry-on suitcase that transforms an airline seat into a toddler bed. Rita charges her phone from the XTEND Carry-on’s USB-C charging port. This slick carry-on cleverly accordions to expand 35% in volume, includes a biometric fingerprint lock, on-board power bank, separate shoe compartment and removable laptop sleeve. 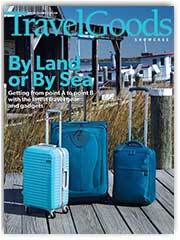 Get the details on these items – plus 113 other new travel products – in our Seen at The Show feature. 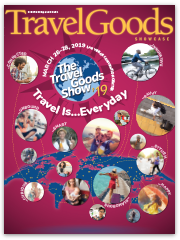 The International Travel Goods Show is the world’s largest travel goods showcase, displaying more than 500 brands, and drawing retail buyers and media coverage from more than 50 nations. These are the people and products that will grow your business, drive consumer demand and create the coming season’s new best sellers. The versatile Milestone Tote Bag from MOUFLON brings a little something extra to the table with its padded section, front suede-like pocket and side shoe pocket. 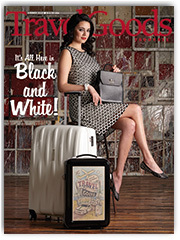 In black combo, the tote can be carried by its two handles or its adjustable and detachable shoulder strap; MSRP: $80. The ZRO 28” 4-Wheel Spinner Travel Case, from ZERO HALLIBURTON’s new ZRO Collection, makes the perfect case for road warriors and the occasional vacationer alike. Constructed of scratch- and shock-resistant Makrolon, each case is designed with function and innovation in mind. Handcrafted in the USA from imported materials; MSRP: $635. As cool as its name implies, the HEX Dakota Drifter Duffel wears its water-resistant gray stripe woven exterior with black coated canvas trim accents well. Stow clothing into the roomy main compartment, tuck your iPad Mini into the front padded pocket and sling the bag over your shoulder with its removable strap; MSRP: $99.95. hardware, and features a removable padded 15” laptop and tablet compartment. MSRP $200. Credits: Photograph By Kerry Pittenger | Model: Nikki Rose, Reinhard, Inc.
Trunkster with innovative rolltop opening, zipper-free entry, integrated digital scale, USB charging, location tracking and matching smartphone app. Measuring 22” x 14” x 9”, it is made of polypropylene and comes in black. MSRP $435. Numinous London’s® SMART Executive Cabin features a biometric (fingerprint) lock, built-in SMART device charger, puncture-resistant zips and anti-slash technology. It comes in dark golden brush. MSRP $414. Knomo London introduces the world’s first in-bag, magnetic wireless charging solution with its Maddox Drop & Go Charging Bag. From Compass Partners. MSRP $395. 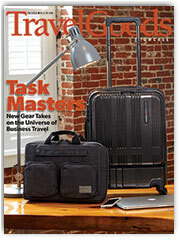 Planet Traveler’s Space Case Utility from HONTUS offers a digital biometric lock with fingerprint recognition; global tracker GPS system; digital self-scale; removable power bank, two external USB ports and another USB port within the laptop compartment; Bluetooth speakerphone; and anti-theft sensors. MSRP $1,300. 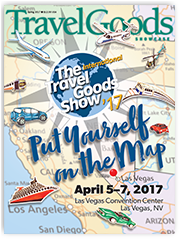 See Seen at The Show feature on these and over 120 new products on display at The 2016 International Travel Goods Show. 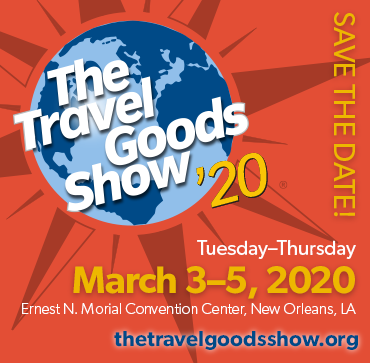 The International Travel Goods Show is all about connection, and meeting face-to-face is the most important one of all. To bring that home, our cover image is a mosaic of people and meetups from past Shows. 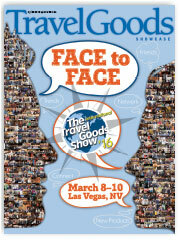 Meet more people who can help drive your business – connect at The 2016 International Travel Goods Show. From RONCATO’s UNO Soft Deluxe Collection is the 22” Carry-on Spinner in champagne. This case, constructed of advanced ballistic nylon with stain resistance, has all the amenities; MSRP $330. Heys’ Heritage is a hardside sophisticate in 100% polycarbonate. The three-piece set (21”, 26”, 30”) is lightweight and expandable; MSRP $684.97. Practical organization is yours with the 3-Compartment Travel Companion from JUMP Paris. Three separate compartments hold your laptop and your travel necessities. A special pocket allows you to hang it on a trolley handle system; MSRP $160. Photographed at Icona Diamond Beach, Southern New Jersey’s premier beachfront resort. Located on an exclusive private beach, nestled between Cape May and Wildwood Crest, Icona ushers in a new level of service and style. This all-suite property delights with fresh, elegant accommodations complete with galley kitchens and ocean-view balconies. The resort also features award-winning Coastal Blue Oceanside Bar & Grill, Bungalow No. 7 Beach Bar, and venues for weddings, events, corporate meetings and retreats. Special thanks to Caitlin Kelly, Marketing Manager, Icona Resorts. Model: John Ward, Reinhard, Inc.
SWISSGEAR 6191 Hardside 28″ Spinner from Group III International. Featuring lightweight construction and maneuverability, this luggage comes equipped with a lightweight aluminum locking telescopic handle, eight 360° spinner wheels and built-in TSA-accepted three-dial combination lock: MSRP $239.99. 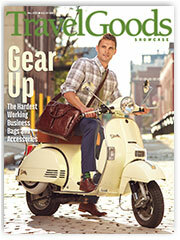 Royce Leather’s RFID Saffiano Convertible Backpack neatly converts into a crossbody bag or handbag. The bag snugly fits technology essentials, including an iPad, and only you will know that it is secretly protecting you from the nightmare of identity theft: MSRP $200. Rollasoles’ Rock and Rollasole with silver studs are fold-up, roll-up flats that can be popped into your handbag, glove compartment or desk drawer, comes with a bag to carry your discarded heels: MSRP $50. This one-of-a-kind handmade Playluggage suitcase was specially tattooed onsite at The 2015 International Travel Goods Show by Playluggage’s designer Kristjan Luiga. Playluggage suitcases feature a lightweight aluminum frame or rubber zipper frame with lining and ABS plastic covers that are moisture-resistant and maintain shape while offering the most protection. The front of the outside shell features a variety of board games to play while traveling. Model: Veronica Lane, Reinhard, Inc.
Special thanks to Anne McAlpin, winner of the drawing for Playluggage’s 2015 International Travel Goods Show custom tattooed suitcase, who graciously donated the work of art to TGA. Lojel’s Groove Frame 19.5” Carry-On in pure Bayer Makrolon® polycarbonate is reinforced with Lojel’s patented material. Super strength in an ultra-light bag with a flexible shell and Hinomoto spinner wheels; MSRP $229.95. The lightweight Atlantic’s Ultra® LITE 3 25” Expandable Spinner is made with water-repellent polyester fabric, with expansion capabilities and high-mileage wheels. 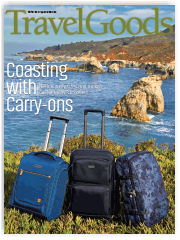 This luggage is easy to roll for travelers of all sizes; MSRP $200. Lipault’s 2-Wheeled 19” Carry-On, perfectly sized for international travel and overhead airplane bins and ultra lightweight at a skinny 5 lbs. ; MSRP $169. Location: Chesapeake Bay Maritime Museum, St. Michaels, Maryland. Special thanks to Debbie Collison and Megan Fisher. The slim-profile HEX Convertible Laptop Briefcase is a clean, modern-style briefcase that can quickly convert to a street-ready laptop backpack. The bag is fully featured with interior padded and fleece-lined 15″ laptop slot, plus assorted interior and exterior tablet and gear pockets; MSRP $109.95. 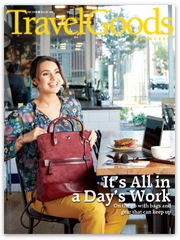 The TRIBECCA, a 20″ mobile office from Traveler’s Choice, sports a quick-access, front zippered pocket with integrated top-load pockets for a 13″ laptop and a tablet and a fully functional organizer for electronics or any last-minute items. This hardside spinner upright also features a built-in TSA combination lock and clam shell opening. MSRP $299.99.